Is That Fret Slot Deep Enough? More than once I had found myself perplexed by a fret that would not gracefully seat itself completely in a fret slot. More often than not the problem was the slot being too shallow for the tang on the fretwire. 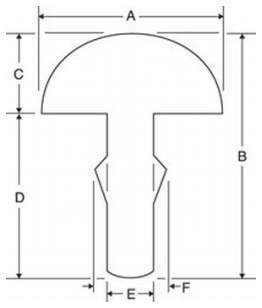 I saw the slots to an appropriate depth when making a dulcimer fingerboard but by the time the fingerboard is trued and leveled the slots sometimes become too shallow. After having this happen a few times I came up with a very simple tool to solve the problem. I took a piece of fretwire and filed the barbs off the tang so it will easily fit into a fret slot. 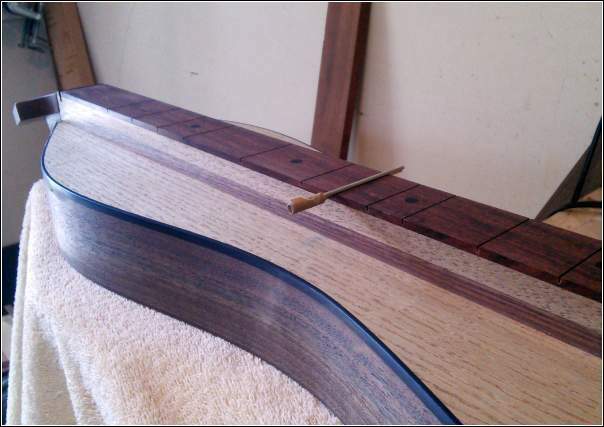 if the slot is deep enough the crown of the fret will seat well on the fingerboard. If not then I need to deepen the slots. The tape on the end of the fretwire it to remind me that this is a tool and not a stray fret that escaped the blow of a hammer. What a great idea! Being a luthier, I can see where developing these specialty tools is important and very handy. Oh, and I love your “dulcimer model” in that photo :). Very pretty and sounds wonderful! Susie: Yup, it’s your dulcimer! So glad you are enjoying it! Getting wise in your old age.